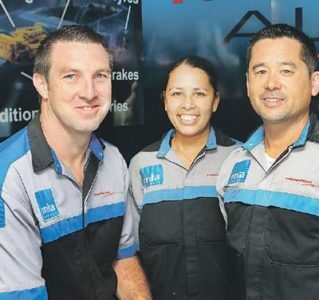 Howick Auto Centre and Electrical have a new staff member on their top team with A Grade mechanic, Brendon Simonson, who will be a familiar face to many locals. He has been in the automotive industry for 28 years working for many years with the well-known company, Steward Motors, which closed recently when the owner retired. “We are all very happy to welcome such an experienced and capable mechanic on board,” says the owner of the Howick Auto Centre, Craig Wallen. The manager, Dion Lowe has been with the business for more than 20 years, now heads a team of six. He is leading their initiative to offer the very latest in cutting edge technology in diagnostic and scanning tools for auto electrical issues. “The business has been here for nearly 50 years, and is now a one-stop-shop for your mechanical diagnostics and repairs, car air-conditioning, warrants and marine requirements. I have just attended a course on common rail diesels – as used in all modern European and Japanese cars – and we have recently installed the very latest in scanning tools. “We invest a lot of money and energy to keep up with technology,” Dion explains. Howick Auto Centre & Electrical is well-known for technical expertise, reliability and quality service in all facets of the marine electrical industry. Their work covers a vast range from trailer boats through to luxury launches and yachts. The company is also the biggest battery supplier in the Eastern suburbs with the most comprehensive range and specialising in Yuasa Batteries. All staff members are warm and welcoming. You pick that up from your first phone call of inquiry to their vivacious receptionist, Tammy Leher. Check their website or visit Howick Auto Centre & Electrical on Facebook.